Market Opportunities Unlimited (MOU) Blog: InfoFree Makes Lead Generation Easier, For Small Businesses! 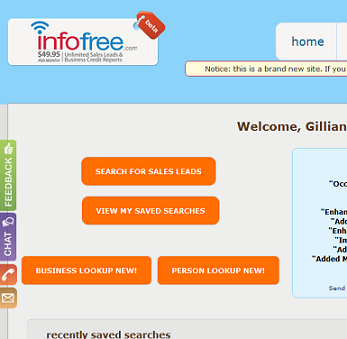 InfoFree Makes Lead Generation Easier, For Small Businesses! If you're a small business owner or salesperson, you know how important sales leads are. [Sales leads are contact and other details (e.g. name, age, income), of potential customers who have the authority and interest to purchase your product or service]. Lead generation - the process of identifying sales leads for your company, is often time-consuming, as these leads have to be collected and collated from varied sources, e.g. database providers, trade shows, directories, and online forms. ...infofree has made this process easy, by providing you with online access to over 50 customer databases, containing over 200 million US persons and over 15 million US businesses. They do this for a low monthly fee of $39.95. To see prospects on a map, thus facilitating more-improved geo-targeting (targetting customers in certain locations with certain products/services). To search by area code. This is in stark contrast to just receiving the flat files generated by other database providers, often in MS Excel format, with dated customer lists - whose updates must be paid for. With such ready access to easy sales leads, you can more effectively and efficiently qualify these leads, using your own criteria to further narrow them down to to sales prospects - people who are now at the stage of readiness to buy your products and services. ...allowing you to experience increased sales revenue at a much faster rate than you would have, had you used old lead-generation methods. With such an improved means of garnering increased sales revenue for your business, why not try Infofree now? (The screenshot above, is from the test-run I gave them today - a test-run that proves that their software is super-easy to use and gives results in seconds). Please use the promo code BLOG39 to sign up...you won't regret it!